You are here: Home > How Good Will The Aluminium Window Painting Finish Be? How Good Will The Aluminium Window Painting Finish Be? 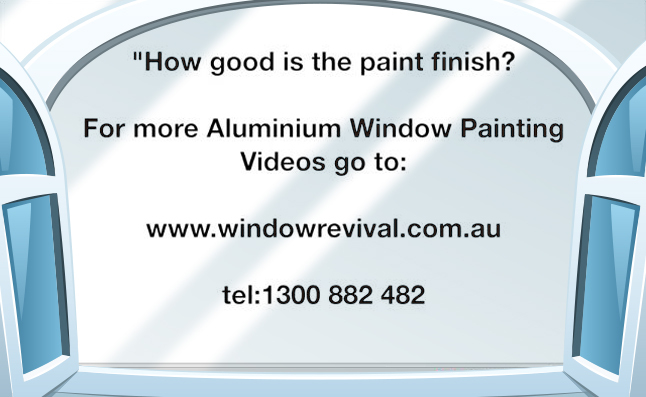 Click the Picture to watch the Video response to the question about aluminium window painting. I’m often asked just how good our finish is. And you know it all boils down to the preparation taken because with the right preparation even the worst surfaces can be made to look fantastic. Imagine a surface so good that it passes the ANGRY Client test. Yeah! We regularly do work restoring new windows that have been damaged during construction for the new window manufacturers. And you could imagine just how upset some new home owners could get when they buy a new house and the windows are damaged. The new home owners’ expectation on the finish we are asked to produce is of a new looking finish, to match all the other adjacent newly finished surfaces. We have never failed to exceed expectations. And it’s these same specific 23 point quality control checklist of systems and procedures that has allowed Window Revival to achieve the highest industry accolades by being awarded the title of Master Builders Painting & Decorating Contractors for 2008.